EVERYONE AROUND THE WORLD ... COME ON!!! IT'S A CELEBRATION AT BLOG PARTY CENTRAL!!! WOO HOO!!! UPDATE: If you come back to tell me you are missing the ELEGANT GALLERY FRAME, I have posted a separate link beneath the other two. I am SO sorry y'all! 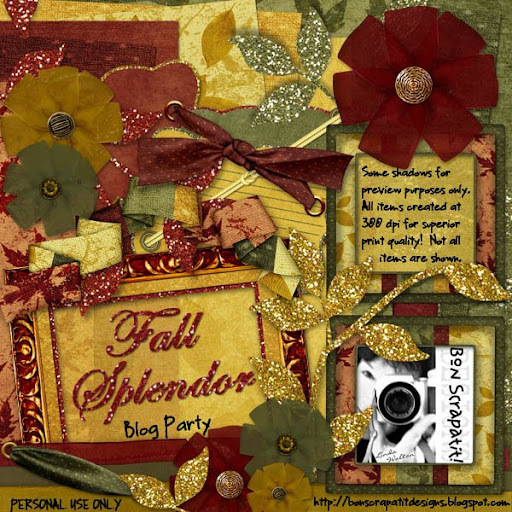 I shall keep my words sparse as BLOG PARTY CENTRAL speaks for itself!!! I wish to extend my SINCEREST thanks to ALL designers who have contributed their time and talents to help make this a ROCKIN' blog party!!! THANK YOU ALL! AN EXTRA dose of GRATITUDE to the AMAZING Kristine aka Wenchgraphix (head on over and leave her some EXTRA lovin' for me, PRETTY please - MWAH!) for her INCREDIBLE leadership and tireless hours in getting this BLOG PARTY together for ALL of us in SCRAPLAND!!! I expressed to Kristine that she has done a FABULOUS job WO-MANNING this project!!! He, he ... THANK YOU KRISTINE!!! You be ROCKIN' mamacita!!! So, as the song declares ... IT'S TIME TO COME TOGETHER!!! WOO HOO!!! CELEBRATE GOOD TIMES ... COME ON ... IT'S A CELEBRATION ... DIGI-SCRAPPER'S STYLE!!! Come as you are!!! PJ's, slippers (I wear my bare feet!) and a cuppa joe are HIGHLY recommended if you plan on staying for awhile!!! He, he ... this is gonna be SOOOO much FUN y'all!!! I get to PAR-TAY with my DIGI-SISTERS!!! WOO HOO! the MAIN PARTY!!! Are we having FUN yet, or WHAT??? PLEASE find my links below my preview, one for background papers and one for the embellishments!!! 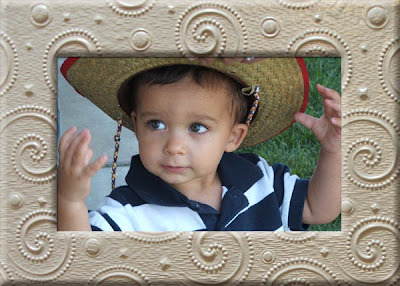 Stay-tuned as I shall be offering up some EXTRA goodies to go along with FALL SPLENDOR and something SPECIAL if you post a layout to the slideshow I put up next week after my return trip to meet our grandson, Riley!!! The time is 12:20 am PST - links have been tested and are in proper working order! I will add images and links to sidebar tomorrow! Night all! BLOG PARTY, BLOG PARTY ALERT!!! Y'ALL ARE INVITED!!! WOO HOOOOOOOOO!!! BACK UP your HARD DRIVES, CLEAR your CACHE, your desks and PREPARE TO DOWNLOAD like MAD WOMEN!!! Well, now that's not entirely accurate is it??? If one is MAD, one cannot enjoy a party, right??? SHEESH! What was I thinking!!! Okay ... rephrased ... 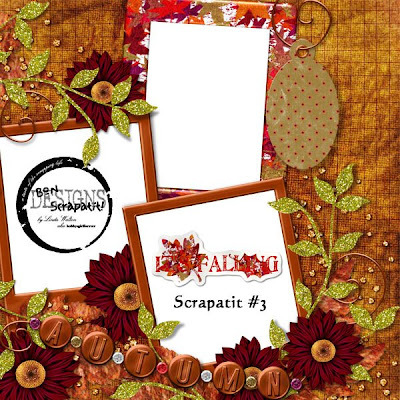 PREPARE TO DOWNLOAD like a DIGITAL ADDICT looking for her next SCRAPKIT!!! Tomorrow night at 11:59 pm EST I shall add a LIVE LINK that will take you to BLOG PARTY CENTRAL where you will see previews of ALL of the contributions LOVINGLY created by over 70 designers!!! That's right, OVER 70 designers and I am QUITE honored to be a part of this, my VERY firstever BLOG PARTY!!! WOO HOO!!! I got my dancin' shoes on ladies - grab yours and do a HAPPY DANCE as you watch all of the GORGEOUS GOODIES filling up your HARD DRIVES for HOURS, DAYS, WEEKS and even a YEAR'S worth of SCRAPPING PLEASURE!!! And where do we live??? SCRAPLAND, SCRAPLAND .... YAY for SCRAPLAND!!! LOL! I shall spare you the BORING details of my PITA with Yahoo! Now that my goodies are finished for October 1st releases, I hope to spend some time tomorrow correcting my tech issues which will most likely be a quick fix by doing some uninstalling and re-installing!!! SO, NO MORE STALLING ... for tomorrow I shall be posting early (yes, I am feeling JUST fine!!! he, he ...) to give you a sneak-peek of my goodies for the October 1st release of the TREASURE CHEST over at TREASURES TO SCRAP! I hope y'all will like it as much as I have enjoyed the challenge of working with a color palette I would have NEVER thought of on my own! I REALLY like the color combo NOW!!! WOW, this makes THREE fall kits I've worked on this past month!!! That's a RECORD for THIS girl!!! And what is MY FAVORITE SEASON??? Hmmmm .... POP QUIZ!!! ROFL!!! OOOPS, almost forgot!!! 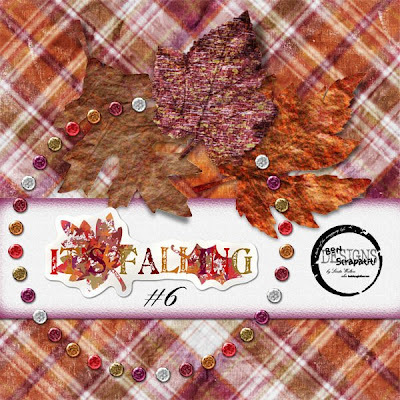 TONIGHT'S freebie includes the NUMERALS from my BURNT WOOD ALPHA in *It's Falling, #17*!!! Tomorrow or Wednesday, I shall include the EXTRAS!!! Night all, SWEET dreams and have a BEAUTIFUL day!!! P.S. Thank you SO, SO, SO very much for ALL of the INCREDIBLY wonderful comments, LOVE and SUPPORT!!! Y'all are THE GREATEST and seeing as how I will be leaving Thursday and away until sometime Sunday, I will try my hardest to reply to as many e-mails and posts as time will allow as I prepare for our trip and meeting of our grandson, Riley!!! MWAH! 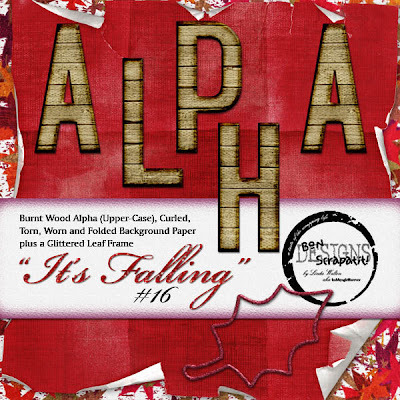 *IT'S FALLING, #16* - BURNT WOOD ALPHA CONTINUED! Evening everybody!!! Hope y'all have had an enjoyable day today! I shall be short and sweet tonight as I've had a SLOW start to my day due to a non-cooperative computer ... or should I say, due to Yahoo being a Pita at start up!!! I decided to shut 'er down once more and this time, headed for the living room to relax a bit with Robert. I took a short nap which was just what I needed and this gave the computer some time to relax as well and allow for me to cold boot it. Well, I outsmarted Yahoo this time and closed out all windows before it had the opportunity to "hang" again! I will probably need to uninstall and reinstall again as Yahoo seems to make this necessary every so often! So, with a LATE start to my designing tasks for the day, I am posting tonight's freebie and then heading to LA-LA-LAND for a FRESH start tomorrow!!! I switched gears from a design project I was working on to make the Burnt Wood Alpha, Upper-Case letters for y'all tonight for *It's Falling, #16* and I just have to MARVEL at MEGA DOODLE INSPIRED'S "Mega Time Saver Action", which consists of four different actions if memory serves me correctly. The one I use for my alphas is "Trim and Save My PNG" and I am just BLOWN AWAY every time I do so because it only takes me SIX minutes to separate 26 letters, name and save them into individual PNG files for y'all!!! I RAVED about this when I first bought it in Brandy's Grab Bag #4 and hope MOST of you ran over and GRABBED it too! You need not be a designer to benefit from this NIFTY little action as it is SUPER for anyone who has a sheet of alphas or elements that they would prefer to have in separate files, especially if you are using a program that DOES NOT allow you to select an individual letter to copy and paste onto your canvas. I LOVE the way it TRIMS away the excess canvas from each item too!!! 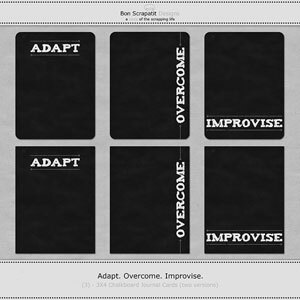 If you are interested, GO ON OVER and visit Brandy's NEW and IMPROVED site where she now has a TEST TEAM trying out her NEWEST innovations and leaving us ALL in SCRAPLAND with some WONDERFUL "freebies" too! WOO HOO!!! Tonight, she has a VERY cool set of AIR FORCE BLOGGER GRAPHICS (tutorial included ... I have SO wanted to learn how to customize my own blog! *overjoyed and ever so thankful to Ms. 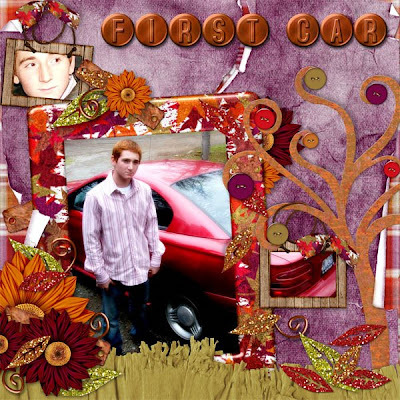 Brandy*) up for grabs that she created to custom design her DH's own SPECIAL blog while he is over in Iraq!!! How SWEET is that!!! Make sure to leave her some some lovin' and if you wish to check out her DH's blog, she has the link posted for us to take a peek! We can leave him some lovin' too!!! You will find links to her assortment of stores there too! The girl is HOT I tell ya!!! Oh, YES, and right now she is featuring some CUTE freebies made by her TEAM with her NEW "Puffy Sticker Action" - check it out!!! If you stop by, tell her Linda says "HELLO, THANK YOU and that she ROCKS"!!! proper working order! Have a SUPER SUNDAY y'all!!! "WOOD" YOU BELIEVE I'VE BEEN "MESHING" AROUND TODAY AND I'VE CREATED YOUR FANTABULOUS FRIDAY FREEBIE??? Uh, HUH!!! Today brings about another FRIDAY FREEBIE and "WOOD" you believe I have another alpha for you? YES, YES, YES and it, of course, it matches the wooden frames you've been collecting already. I played with BLENDING MODES in PS and applied a "burnt" edging around the inner and outer edges giving a bit more of a RUSTIC, OUTDOORSY feel! Hope you like it!!! I shall also have the matching numerals for you this weekend and "WOOD" y'all like a set of Upper-Case letters too??? Raise those LOVELY hands and wave them WILDLY so I don't miss anyone!!! ROFL! Then ... I was "MESHING" around with a WONKY MESH TEMPLATE created by Karen Wallace, applied a STRING STYLE, applied a COLOR OVERLAY and TWEAKED the BLENDING MODES until I came up with something that looks like the REAL DEAL or so I am hoping!!! 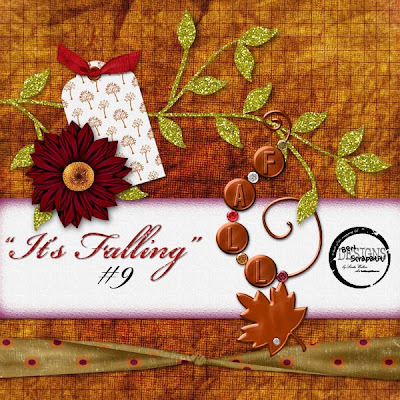 Let me know what y'all think of *It's Falling, #15*! As ALWAYS, I dearly appreciate your comments and feedback as it HELPS to keep me INSPIRED to keep on creating for you and also to LEARN where I need to HONE my skills!!! See ... it's a GIVE and TAKE!!! Thank you!!! Speaking of chapters in a book, I have had such a WONDERFUL response to me sharing my story of reunification with my birth mother that I've decided with all of the other projects I have going and news to share that I shall bring you my story in installments. Sound good to you??? You know, I can start by setting the stage, if you will, for "why" I was separated, "what" transpired during the YEARS of separation and then, of course, WHEN, WHERE and HOW we were reunited!!! I am in the midst of a couple of designing projects that will keep me VERY busy until about mid-week, which puts October 1st as the middle of the week and a Wednesday. Oh my, I'm getting chills as I think about all of this - why October is the month I was located back in 1997 AND it is also my mother's birthday. I will give you a little TIDBIT I found VERY interesting when speaking with Mama for the VERY first time, she shares the SAME date of birth as my baby brother, Tom, who I was raised with!!! LOL! My daughter, Joan, thinks I'm weird because I have this "thing" with finding similarity in certain names and numbers with other people I know!!! I'll explain that in more depth later on too! 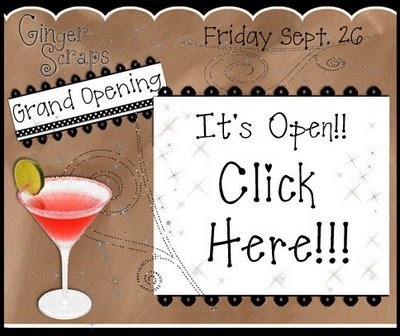 Have y'all been to GINGER SCRAPS brand new site??? Do I see a MULTITUDE of hands waving at me out there??? I bet so! Y'all know Ms. Ginger as she has been SO gracious as to be a WONDERFUL source of FREEBIE listings for ALL of us in SCRAPLAND and now she is a BONAFIDE designer with her own BONAFIDE store!!! HURRY on over this weekend for some SPECTACULAR goodies, challenges and Ginger and the girls are even giving out $5.00 store certificates plus TWO free kits for a limited time!!! WOW, did I just say FREE??? Uh, huh, I did!!! Okay, what are we waiting for, CLICK HERE TO HOP on over and sign up in the FORUM, introduce yourselves and PARTY ON with GINGER SCRAPS!!! OH, by the way, how can I forget to share something SO important with y'all - I have WON twice this week!!! ME! Li'l 'ol ME! This is HIGHLY unusual for this girl and TWICE in the same week!!! WHOA! Pinch me please!!! I won an RAK from the FABULOUS and INFAMOUS *Kim B*'s store and then AFTER MIDNIGHT this morning as I was finishing up my blog post and waiting for Ginger's site to go live, I hopped on over, introduced myself and before I left the site I already had a Private Message from Ms. Ginger personally letting me know that I was the VERY first winner at her FABULOUS grand opening!!! Can we say I was just a little surprised!!! YUP! I SURELY was and still am!!! Thank you KIM! Thank you GINGER!!! You ladies ROCK ... and then SOME! He, he ... and SO do y'all!!! I will have to share my purchases when I have time to browse their stores and pick something out!!! Now, after you visit Ginger or before (depends on which direction you are coming from!!! 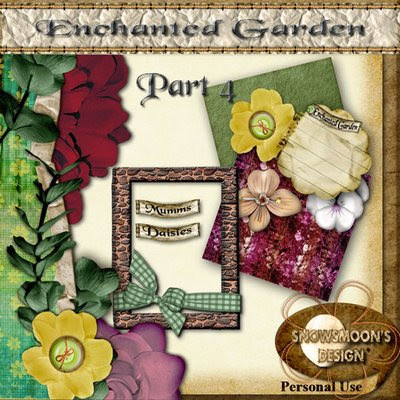 ), CRUISE on over to my BFF's blog, SNOWSMOONS DESIGN and pick up the FOURTH installment in her GORGEOUS, *ENCHANTED GARDEN* series!!! CLICK HERE TO CRUISE!!! Dawn has outdone herself with this LUSH creation!!! I will have you know that the FENCE/GATE in the SECOND installment (I hope I got that right!) was created by her personally and I ADORE it!!! It is TRULY unique in that it is like NO other that I've seen! Make sure to leave Dawn some LOVIN' and let her know that her BFF sent you over, K? TY! MWAH! I have a few other announcements and/or goodies to share and I shall leave those for another post! REMEMBER: If you wish a matching *Burnt Wood Alpha* in Upper-Case, wave those hands WILDLY for me to see!!! 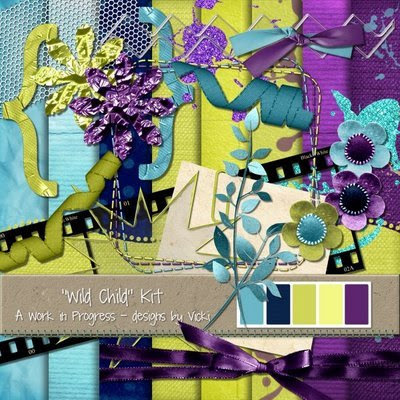 OHHHHHH, speaking of WILDLY, have y'all been collecting Ms. Vicki's new kit this week, *WILD CHILD*??? I have! CLICK HERE TO FLY on over to see and download the PAPERS, ELEMENTS ONE and TWO and the REALLY cool MESH ALPHA!!! As always, make sure to leave her some LOVIN'!!! You will LOVE the color palette! Well, have I RAMBLED y'all a GOOD one tonight, or WHAT??? SO much to say and SO little time - have a FABULOUS weekend dah-lings and ENJOY your FANTABULOUS FRIDAY FREEBIE and ALL of the other GOODIES to be found in SCRAPLAND!!! WOO HOO!!! HAPPY BLOG ANNIVERSARY TO ME AND A GIFT FOR YOU!!! Hi y'all!!! Progress is being made on this side of my screen!!! YES, I'm finally making headway and doing some MUCH needed catching up with my designing! I have spent the past two days pretty much in "lockdown"! And what does that mean exactly??? LOL! Well, NO distractions, NO IM's open, NO e-mail programs open, NO shopping or cruising galleries - just ME, my mouse and I!!! Okay, I cannot neglect to mention Photoshop! When the MOJO kicks in, I've got to go with it before it decides to up and leave me as it had the past week or two. Tis a fact of life, the 'ol brain just has to recharge every now and then and, of course, it is usually when you need it to work the most! ROFL! How many of you KNOW what I'm talking about??? Uh, huh ... I SEE those hands waving! Uh ... yeah .... gosh, I think I see little men in white coats too!!! Today was my FIRST-YEAR anniversary here on BLOGGER as BON SCRAPATIT DESIGNS! I should be CELEBRATING with y'all, but I'm TOO pooped to party!!! He, he ... actually, I am TOO busy to party at the moment so just as soon as I'm all finished with prior commitments, I shall create something SPECIAL for y'all as my way of saying "THANK YOU" for your continued support of my designs and for giving me CONTINUAL inspiration via your WONDERFUL comments! I was going to celebrate my 300,000th blog hit last month, but decided I'd pool both CELEBRATIONS together and make it REAL fiesta - sound GOOD??? Remember: I am "older" and "slower" so I shall try my VERY best to have some SPECIAL goodies for you in the next couple of weeks! I'm beginning to believe that my "slower" is due to my critical eye for detail! I'm such a stickler about "if it doesn't look right, change it!" and a few other assorted blurbs!!! Will I EVER change that part of me? I doubt it. So, I appreciate you "hanging" in there with me as I strive to be a better designer!!! I really wished to post about "The Locator" tonight, but my designing duties are taking presendence at the moment so I will chat with y'all about that, perhaps tomorrow. I even watched a segment earlier tonight as my DARLING Robert called in to me - "Babe, Troy's on"!!! ROFL! I kid you not and guess what? I got up and joined him to watch an episode we had been waiting for on Saturday and for some reason or other missed it! Such is the LIFE and that is why I SO appreciate shows of this caliber being repeated during the week!!! Thank you WE and thank you Mr. Dunn!!! Needless to say, Robert and I both had the tears flowing again! QUESTION. Would y'all like me to share a bit about my personal reunion with my biological mother after being separated for over 40 years??? LOL! That's a tidbit of info right there y'all, you know I'm OVER 40!!! WAY over 40!!! LOL! Okay, RAISE THOSE HANDS HIGH!!! If I see enough hands raised, I shall track down some photos and a couple of layouts I've made since beginning digital scrapbooking and I will share how we were separated, how I had an opportunity to have my mother searched for by a well-known PI and how that door was closed as it was NOT meant-to-be at the time. A decade later, the tables turned and "I" was the one found!!! I not only was reunited with my mother, I also met three brothers and three sisters I had NEVER known!!! You should see the SIZE of the family I inherited on that day, October 8, 1997. This was also my second daughter's 18th birthday!!! OH MY GOODNESS - I had better get my self to bed so that I can get my six hours of sleep (looks like I'll be sleeping until 9 or 10 am!) and head back into Photoshop in the morning!!! 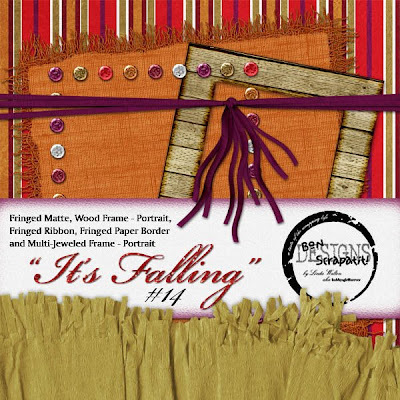 Thanks for hanging out with me tonight and I hope you enjoy tonight's FREEBIE from *It's Falling*! 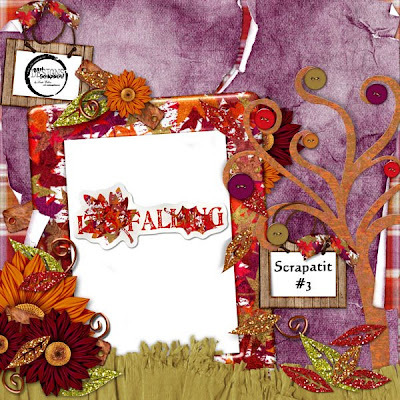 Scrapatit #4 will have you scrapping MANY a "fallish" photo and is well-suited for ANY outdoor photos at the park, hiking, fishing, vacations or a venture out in your own neightborhood to enjoy the BEAUTY of fall foliage!!! The two hanging frames can be used for either extra photos or a mix 'n match of photos and journaling. I've left room for journaling on the "grass" and a title at the top - GREAT opportunity to use the copper alphas you've already downloaded! SURPRISE me y'all!!! I know, I know, NO slideshow to upload to yet. I shall get that into place this weekend. I was ALMOST there but was unable to locate the info on the coding I need to add while searching "Dummie's Guide to Google Blogger"! BE NICE!!! He, he ... Have a TOTALLY terrific Thursday everyone!!! FFF is right around the corner!!! WOO HOO! showing off his FIRST CAR. I was SO prould of him! He worked VERY hard, saved his money and VOILA! proper working order! G'day SCRAPLAND!!! I'VE "DUNN" BEEN LOCATED BY "THE LOCATOR" AND Y'ALL WILL FIND ANOTHER GOODIE FROM ME!!! Okay, it's LATE, I'm bushed and have I got a lot to chat about!!! I know, I know, what else is new? ROTFLMBO!!! Since I wish to give the topic of "missing" loved ones all of my focus when sharing with you, I shall begin to share a few things with you throughout the week as I am afforded the time. Finding LOST or MISSING loved ones is VERY near and dear to my heart and Troy Dunn has rekindled the smoldering flame of passion I've LONG had for this subject matter that is HEAVILY intertwined with our DIE-HARD digital addiction of PRESERVING our MOST precious and PRICELESS memories!!! PHEW - that was a LONG-WINDED sentence! Sorry - I am JAZZED and pressed for time all at once!!! Can you say ADRENALINE??? ROFL! I cannot even begin to tell you how shocked I was to find a personal comment left on my last blog post from Mr. Dunn himself! WOW! That speaks VOLUMES to me and only intensifies the already INCREDIBLE admiration that both Robert and I have for Troy and his passionate life of RE-UNITING love ones. I called Robert at work and read the post. My BIG, STRONG loving man, had tears in his eyes as I read on! Robert was SO touched that he asked me to e-mail him the link because he wanted to print it out!!! My DARLING Robert, gotta LOVE this man - he is PURE GOLD in my eyes and I am SO blessed to have him to spend the rest of my life with! Another TOOT for technology and the Internet as Troy was alerted by Google via a PING letting him know of my post speaking about his NEW show! How AWESOME is that!!! Anyhoo, for those of you NOT familiar with Troy's BRAND NEW television program, "The Locator" on WE tv (I just found out today that this stands for Women's Entertainment! Goes to show you how much television I watch, eh? LOL! Not a whole lot, but I will be watching THIS show!) I am going to be posting some information over the course of my next few posts and if ANY of you have a loved one that you've been missing or YOU know of ANY one looking for a lost or missing person near and dear to their hearts, PLEASE stay-tuned! 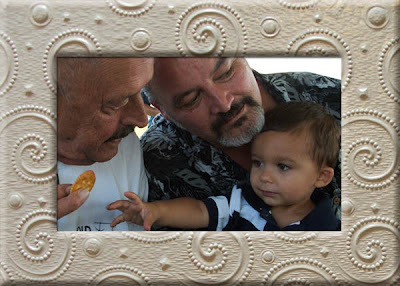 Troy Dunn began his journey of seeking those missing 20 years ago when his own Mother, Katie, had been searching on and off for 20 years for her biological parents and with the aid of another, Troy located Katie's mother in five months. Katie works along side of her son and is as she calls it, a "research specialist"!!! I LOVE IT!!! Anyone who knows me WELL, knows that I LOVE to research and I've often been known to say that I should have been a detective!!! I also have a lot of determination and am one of those who will many times leave the store with an item that APPEARS to no longer be in stock, as I will search in places that I guess are not obvious to some. Now, this MIGHT be because of my several years of retail work after high school, but I'd like to think that I REALLY am a determined person!!! LOL!!! HA, HA, HA .... and here I am "determined" to make you believe that I am indeed!!! YEP, it's past RUM-DUMMY hour and I am in dire need of a good night's sleep after such a creative and awe-inspiring day!!! Gotta fly (yup, I got me wings on tonight!!!) just as soon as I post your FREEBIE! I may have a bit of a SNEAK-PEEK for you tomorrow night on my latest project which is part of the OCTOBER Treasure Chest over at Treasures To Scrap. I have SO enjoyed working with this color palette and REALLY enjoy the challenge of designing with colors that I would NEVER think to put together!!! REMEMBER: Beauty is in the eye of the BEHOLDER and LIFE is always a bit RICHER when we travel outside of our comfort zone and experience something WE would not necessarily choose to partake in or of!!! 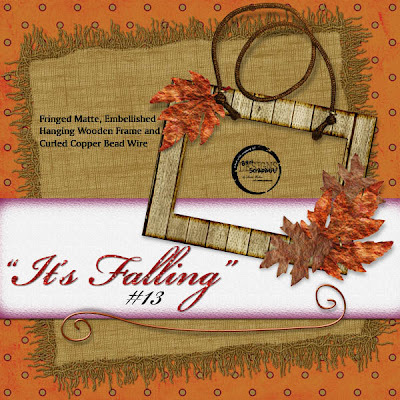 I have included in *It's Falling, #14* the WOOD FRAME without any embellishments for those who wish to add their own or NONE at all!!! The GREEN fringed paper border is a FABULOUS element to use for "grass" at the bottom of a layout if you wish to layer the leaves or place one of the TREES along with it for a nice outdoorsy effect!!! Love to all .... see you tomorrow .... take care of your SWEET selves and thank you for being patient with me as I continue to play "catch-up" with e-mails, comments, etc.!!! Y'all are THE BESTEST!!! proper working order. Have a WONDERFUL Wednesday!!! I AM NOT ABLE TO "LEAF" Y'ALL ALONE YET!!! WOW! What a DIFFERENCE a day away from the computer can TRULY make when one sits for hours unable to focus or to make much sense of anything!!! I suppose that can happen from staring at TOO many pixels for hours, days and weeks on end!!! ROFL! The eyeballs rebelleth!!! Yes, I'm sure being MAMA BIRD and failing to SWOOP down and recover my fallen hatchling sooner than I was able to did keep me a BIT preoccupied, but I am happy to report that ALL is well! Let's just say, some things my youngest saw whilst in the BIG CITY (just happened to be San Francisco too!) have made him appreciate his family MUCH more than he already had AND, the experience allowed him to check himself. This just HAPPENS to be a young man who puts up a good front while battling within. All-in-all, he is well-grounded in right and wrong and the horrific traumas of the past leave him with some fears that I believe a good many of us face or have faced during our growing up years. I relate very closely as I had some of the VERY same fears when leaving the nest! Again, I see how important having extended family nearby and a part of one's life really is. Not saying that one is not able to succeed without, as I made my way (only took 40+ years!!! ), but sure does help simplify things a bit a well as giving a little extra cush during a rough patch, eh? LOL! We are ALL so different in character, personality, etc. and it is not always easy to figure how a person will react in any given situation. I know even for myself at this stage of life, I can calculate what my reactions to something might be, but until I am actually IN the moment, I do not know FOR SURE! Okay, enough of that and I'm hoping I made sense as y'all know it's my RUM-DUMMY hour over here and I'm fading fast! I had an enjoyable weekend spending time with Robert and I actually stayed awake into the wee hours of this morning watching movies on Lifetime! I tell you, some weekends they have such an incredible selection and MOST are based on TRUE events which are my FAVES!!! Anyhoo, when I am not feeling up to snuff and am unable to focus on a project, watching a bit of television relaxes me and helps to recharge my built-in batteries! Don't ask what size - he, he!!! Oh my, speaking of television, has anyone been watching the new show called THE LOCATOR with Troy Dunn??? I will simply tell you this - Robert and I both grew up without one of our biological parents. Many of you know that I was just reunited with my mother a decade ago and Robert met his biological father's family 15 years ago. Robert's father passed away whilst Robert was en utero. So, you can ONLY imagine what it looked and sounded like at our home as we watched families being reunited with a LOST loved one!!! What a couple of saps we are!!! OMGosh ... have tears will roll!!! Very touching and having found the birth mother of a young lady here in my community ten years ago and then finding my mother's baby sister after my baby sister had found me after my mom not seeing either of us for over 40 years, it is such joy to see Troy Dunn is doing what I would SO loved to have started those ten years ago!!! YOU GO TROY! SANDY love - if you are seeing this, please e-mail me if you are still needing to remove the border from your blog. I'm figuring you've figured it out by now, but just in case you haven't - lindawalton at caltel dot com! SHARON - I hope this finds you feeling none or VERY little discomfort in that knee and PLEASE, PLEASE, PLEASE let me know the stats on your NEW grandbaby!!! WOO HOO .... very close to Jace and Matt's birthdays!!! Tomorrow is my nephew, Vincent's birthday! I believe he is turning 7!!! What a BUSY, BUSY month we have had and I cannot wait until the beginning of October as we will be meeting our little grandson, Riley, for the FIRST time!!! Hope ALL is well with EVERYONE! Have a GRAND week and I guess you can see I still have not been able to post a slideshow. I am thinking that rather than me starting a new slideshow for each new blog series, that perhaps I should just have one slideshow for ALL layouts that y'all create and wish to share with me and ALL of SCRAPLAND. Whatcha think??? Should I post a poll? 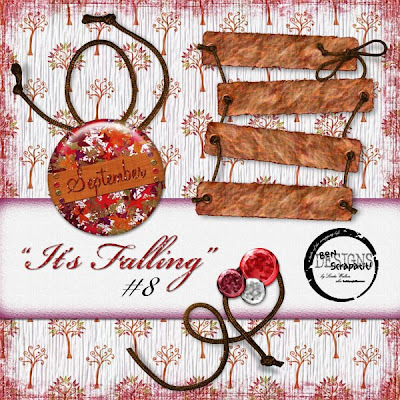 Tonight's FREEBIE is *It's Falling, #13* which includes a hanging leaf clustered wooden frame and a few more ribbons. I left the frame fairly simple so that y'all can add your own touches; i.e., flowers, tags, bows, etc. Let me know if you would like for me to post just the hanging frame without the leaves and I will add it in with the next download, okay? SWEET DREAMS darlins' .... hope to see you tomorrow! proper working order! HAVE a HAPPY MONDAY y'all! 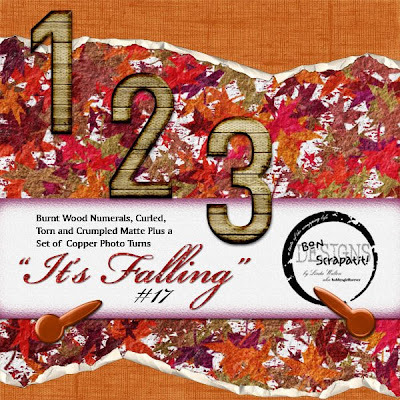 *IT'S FALLING, #12* AND A QUICK HELLO!!! Yes, I do mean QUICK this morning!!! Firstly, THANK YOU, for ALL of your LOVELY and ENCOURAGING comments!!! I REALLY needed them today!!! I shall catch up with you all EARLY Sunday morning (also my oldest son, Matthew's 26th birthday!) and fill you in! One of my babies who has recently tried to leave the nest was not able to spread his wings QUITE far enough and he took a bit of a fall, so Mama spent some time with him late last night and today! I'd like to extend another HAPPY BIRTHDAY wish to my BRAND NEW son-in-law, Travis!!! We LOVE you and hope you had an AMAZING dinner with your BEAUTIFUL bride!!! 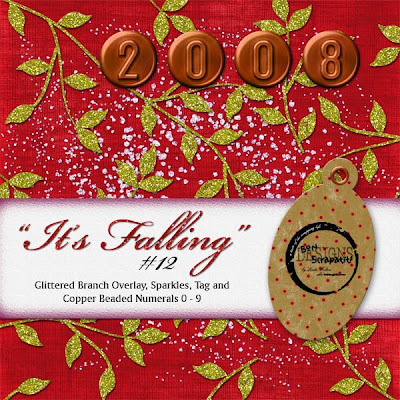 He, he ... TODAY'S freebie, *It's Falling, #12*, includes a glittered branch overlay, a tag, sparkles and the numerals (0 - 9) to complete the Copper Beaded Alpha! Have a SUPER Saturday y'all ..... HAVE FUN!!! HAPPY hour 24/7 here in SCRAPLAND y'all!!! YOUR FANTABULOUS FRIDAY FREEBIE HAS ARRIVED EARLY EVEN!!! LOL! WHOA NELLIE!!! HOLD THE PHONE! Take my temperature PLEASE!!! Am I feeling okay??? Oh yeah, look out SCRAPLAND, this girl has actually, can YOU believe it, she has ACTUALLY posted your FFF 24 hours earlier than normal!!! WOO HOO!!! Now, don't ask me WHY? Okay, I'll give you a little hint! Uhm ... er ... gosh ... would you believe ... I got horribly sidetracked and was TOO late for my Thursday night post??? ROFL! YEPPERS, that would be the reason! However, as I am thinking about it, this is probably the way I should do it every week, ya think? I mean, it would ONLY make it a "bona fide" FANTABULOUS FREEBIE FRIDAY here at Bon Scrapatit Designs!!! HA! What a concept, eh? Yes, you guessed it ... it is none other than RUM-DUMMY hour over here and I best be putting myself to bed VERY soon! How is everybody??? Are you READY for Friday??? Anybody have to work on the weekend? Oooops, let me rephrase that, does anyone have to work "outside" of the home this weekend? And, NO, I don't mean out in the yard or outdoors!!! LOL! I can just see those intelligent wheels turning out there! Are you ALL (this side of the globe) ready for FALL??? Do you like to decorate? What are your FAVORITE decorations? Why? YES, I really wish to know!!! Please post here on my blog so I shall be sure not to miss what y'all are up to for the FALL SEASON, K? 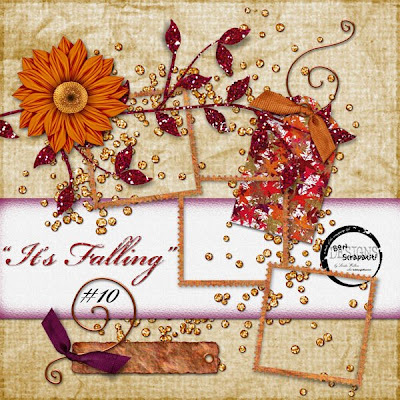 That reminds me, I'm still working on getting the slideshow up and running for *It's Falling*. With the new blog template, I have to add some HTML code to allow me to do so and I've been up to the eyeballs in busy-ness this past week. I will get it up just as quickly as my fingers will let me. Okay, I'm off to bed and I wish you ALL a WONDERFUL weekend ahead and I hope y'all get some GOOD scrapping time in! 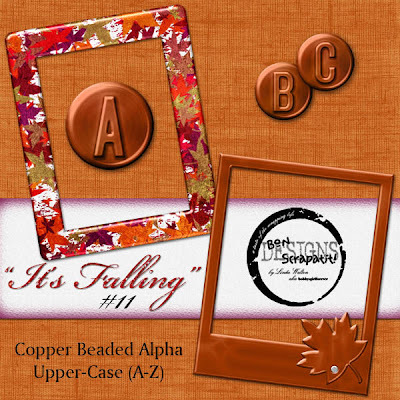 Your FFF today is *It's Falling, #11*, which includes a COMPLETE upper-case Copper Beaded Alpha!!! I will post the coordinating numerals for y'all tomorrow night!!! proper working order! HAPPY FRIDAY EVERYONE!!! HOLY "SKYPE" SCRAPLAND ... GUESS WHO I TALKED TO TODAY??? OMGosh y'all!!! What a WONDERFULLY pleasant day I've had today chit-chatting with some DEAR designer friends!!! Well, I'm sure you are WONDERING whom I've SKYPED with today, eh??? He, he ... I'm giggly just thinking about it as it is someone that Y'ALL know VERY well and I have to tell you that she is EVERY bit as SWEET, FUNNY and CHARMING via voice as she is on her INFAMOUS designing blog! Any guesses??? Hmmmmm .... I shall give you ONE hint .... she is as we ALL are, "a work in progress"!!! YES, YES, YEEEEEEEEEEEESSSSSS!!! Indeed I have spoken with with SCRAPLAND'S very own DESIGNING SENSATION - Ms. Vicki Parker!!! WOO HOOOOOO!!! I think we must have chattered away for nearly two hours!! Now I am sure she will correct me if I am wrong, but you know how it is when you get to talking away and before you know it, HOURS have passed! Good morning Vicki love!!! I know she is just getting to work and will, hopefully, have a moment to check up on us before she gets down to business!!! I had a blast getting to know you even better than I already have Vicki and I look forward to speaking with you again soon! Vicki has the MOST lovely English accent and I had to try VERY hard not to begin sounding like I was in the UK along side her!!! We both adapt ourselves to accents rather easily and I SO relished the time absorbing every bit of who she is!!! Vicki and I both STRONGLY agree that one of the GREATEST benefits of online friendships is that we TRULY get to know the SOUL of the other without any distraction of the outer shell! I am sure MOST of you feel the same way! Gosh, my BFF, Dawn aka Snowsmoons Design is a good point-in-case, as she and I have known each other 3-1/2 years and have yet to meet face-to-face! And then there is my DEAREST, SWEETEST friend, Carole Nordyke whom I should be speaking with tomorrow! I can bear my soul to these AMAZING ladies as if we've known each other FOREVER!!! Well, I'd better get the GOODS going here before I faint away from this MOST exciting day today. Why, just a little bit ago I was IM-ing with another FABULOUS designer, Barb Derksen! Yeah, I'm tickled as all get out and now I shall have VERY sweet dreams thinking about ALL of us in SCRAPLAND having a BIG get-together one day! Would NOT that be THE BEST??? Ahhhhh .... even if ONLY in my dreams!!! 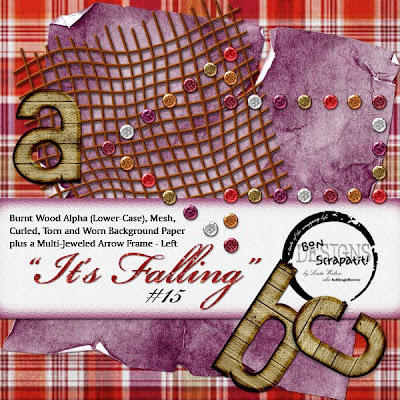 Tonight's FREEBIE is Scrapatit #3 from the ongoing blog series, *It's Falling*! 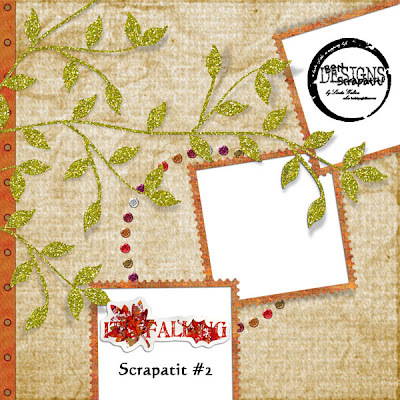 I normally design my own "scrapatits" but this time I was in AWE and TOTALLY inspired by a couple of QP's created by Jen Ulasiewicz Designs and scrapped with by Phuong Ton!!!! Simply GORGEOUS work by both of these remarkable designers! I hope you ENJOY it as much as I have in it's creation!!! Thank you SO very much for your continued support of my designs and for your MOST lovely and thoughtful comments! I DO so enjoy reading EACH and EVERY one of them! MWAH! *IT'S FALLING* BLING!!! MORE AUTUMNAL PRETTIES FOR Y'ALL! VERY short post tonight dearest ones as I am going to bed early tonight - before midnight, WOO HOO!!! I shall be back tomorrow night with MORE goodies AND a few photos from Joan's wedding as mentioned in a prior post. I just spoke with my oldest daughter a few hours ago and Joan has just received their photos from the photographer and she says they look AWESOME!!! *Giggle, giggle* - I SO cannot wait to see some of them! Night all, SWEET DREAMS to those heading to bed soon and GOOD MORNING to those across the ocean just waking up! proper working order! ENJOY the day and those near by! OH "DEERE", WHAT A PARTY IT WAS AND A GIFT FOR YOU!!! Yes, DEERE, as in "John Deere"!!! 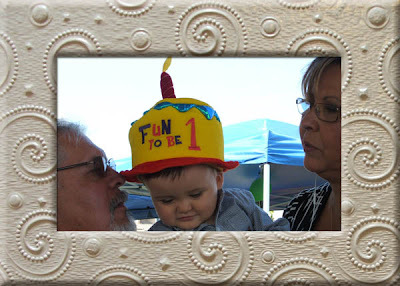 What a DARLING theme for a "country" birthday party in the small community of Newman, California! TOO cute it was and the cake was SOOOOO large that Lohgan had his own special cake to dig into after hearing HAPPY BIRTHDAY sung by ALL! I teased as I remarked to Robert, and later Lohgan's grandma Debbie, that it resembled a forty acre parcel!!! GOSH, it was SO cute! 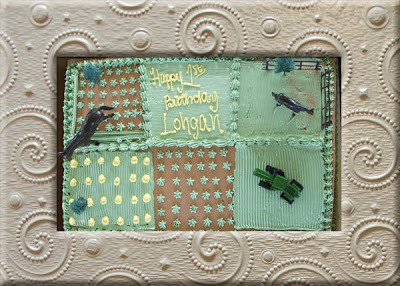 And, YES, there just HAD to be a John Deere tractor sitting atop all of that acreage as well as rows of YUMMY veggies ala ICING! Robert and I were both AMAZED at the crowd present and the presents crowding one entire picnic table!!! I guess we failed to remember just how LARGE this family is!!! Poppa, Clint (Robert's younger brother), Liko (Robert's older brother) and I ALL agreed that little Lohgan took more home on his FIRST birthday than any of us did in our lifetime of birthdays!!! LOL! My, how times HAVE changed!!! There were LOTS of baby boys in attendance and ONE little baby girl! It was NICE to see a SPLASH of PINK amongst all of the BLUE! I'm not sure I even got a photo of her now that I'm thinking about it! I am cautious and don't like to intrude and these were people I'd never seen nor met before, but I did take photos all around the perimeter trying to capture everyone there! I am dealing with a bit of a headache tonight so I am going to post as many photos as I am able before climbing into bed. I was SO happy that I felt SO good all day yesterday but somehow managed to wake up hurting this morning. How does THAT happen??? LOL! Anyhoo, your FREEBIE for tonight is *It's Falling*, Scrapatit #2 and I have used it to scrap a photo I took of Kaleb on Wednesday while he and his daddy were here visiting Grandma!!! GOSH, we are certainly blessed with some BEAUTIFUL grandsons and we are SOOOO excited because two weeks from now (actually a little less than two) we are going to get to meet Riley for the VERY first time!!! Riley is between Dillon (18 months tomorrow) and Lohgan (one year TODAY!) and is closer to Kaleb in coloring as he is fair-skinned and light-headed (sounds like me right about now , light-headed that is!!!). I'm not sure what color Riley's hair is at the present time - it was a strawberry blonde like Kaleb's but I think Travis mentioned that it had darkened. I cannot wait to take photos of Riley!!! WOO HOO!!! 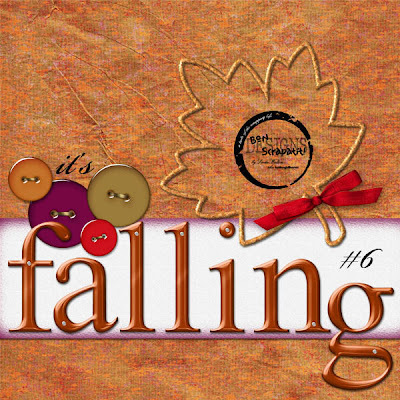 Have an AWESOME week everyone and I will work on getting the slideshow in place for you to upload your layouts to using *It's Falling*!!! I am looking forward to seeing them!!! Thank you, thank you for ALL of the WONDERFUL comments - y'all know how to make a girl feel GOOD and how to keep her INSPIRED!!! 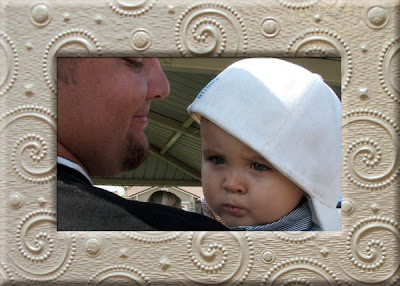 Lohgan in his daddy's arms and wearing his daddy's cap! the goods, Dillon was sure to visit often!!! little boy reminds me of the Energizer Bunny!!! Too cute! and grandpa on his mommy's side of the family! SO sweet! the picnic bench and hold my camera over it and shoot!!! Lohgan eating birthday cake - YUM, YUM! 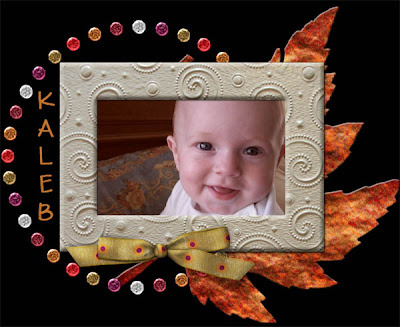 Kaleb Jace at five months!!! SO adorable and growing fast! WHAT DAY IS IT??? 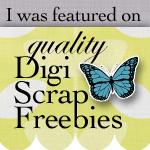 WHY, IT'S FANTABULOUS FREEBIE FRIDAY HERE AT BON SCRAPATIT DESIGNS! Hi y'all!!! Hope to find everyone ready for a weekend of HAPPY scrappin'!!! Robert and I will be leaving, after he returns from an important meeting at work, for our grandson, Lohgan's FIRST birthday party tomorrow. Party starts at NOON in the park! Robert will be home around elevenish in the morning, we stop to pick Wyatt and Garret up and then we'll be on the road for two hours and should arrive between 1:00 and 1:30!!! I just don't wish to miss THIS first birthday party AND I am prepared to capture some PRICELESS memories, naturally!!! I am leaving the GOODIES and turning in tonight as I am still not up to snuff and I don't wish to overdo and especially need a GOOD night's sleep for a LONG day tomorrow! I have to share with you something special that happened today. Robert and I both have been experiencing a lot of changes in our physical abilities. Robert works out everyday so it's DEFINITELY not from lack of exercise on his part - let's just say, we are really beginning to feel the effects of "getting older"!!! Anybody KNOW what I'm talking about??? Uh, huh .... oh YEAH! Okay, enough of my rambling .... on to the GOODIES - *It's Falling, #9*!!! ANNA J - hope you see this darlin', I have not had anyone else express difficulty in downloading so I am guessing the trouble may be on 4-shared's end or it could simply be many downloading at the same time making it kind of like a traffic jam, KWIM? I have this happen to me when downloading from other sites and I just give it a bit and then go back again and it downloads just fine. PLEASE let me know if you continue to have trouble ... lindawalton at caltel dot com. proper working order! HAVE a FAB weekend y'all!!! LOL! Thought I was gonna say "The Yellow Brick Road" didn't ya??? ROFL! Well, I guess you can tell that yours truly is feeling a WHOLE lot better tonight than she has the past two to three, eh? Uh, huh!!! I used to prefer e-mail for keeping up with my faveortie blogs, however, you can now see that I've also added my own PERSONAL blog roll (also courtesy of Blogger, thank you very much!) as I find it easier for me to track MY faves, which you can check out from my blog as well! My day was full of visits today so I have not accomplished much digitally, other than copying files from both of Mark's cameras when he brought my PRECIOUS Kaleb to visit Grandma this afternoon. Aside from laughter, I don't think there is better medicine available to help one rise above a bit of bodily discomfort!!! My baby boy is growing SO quickly! He is five months old as of the 7th and this Saturday Robert and I shall be attending the FIRST birthday party of our grandson, Lohgan, who lives two hours from us. I'm SO excited!!! My computer is SO full (plus two EHD's) that I actually copied photo files onto Robert's laptop as it has LOTS of room!!! Shhhhh .... don't tell!!! He, he ... Just kidding! He won't mind as he knows I prefer the burning software installed on his laptop as mine has been a bit sketchy lately! I will burn the files onto DVD and then delete them. Easy, peasy as my good friend Karen would say!!! If you are peeking in girlfriend, glad to hear you are healing up nicely and I shall be catching up with you soon. I will try to catch y'all up with photos ASAP. I owe you Yosemite and I just snagged a few of Joan's wedding photos taken by the photographer (a GOOD family friend) that I wish to share. I SOMEHOW missed the fact that my daughter was captured on film with Kate Bosworth!!! OMGosh, how funny and sweet it was when I read her caption that said, "OMGosh, Kate Bosworth was at my wedding", or something like that! And then, I shall also have to post a few photos of Kaleb love!!! Carole, dearest, I had one distraction after the other (all GOOD ones I'm happy to say!) and I try to call you tomorrow sweetheart. Carole has been given a good report by her doctor after her recent back surgery - WOO HOOOOOOOOOOO!!! Time to CELEBRATE!!! Gently, of course!!! LOL! I'm tuckered so I shall say "good night" y'all, sleep well and I shall catch up with you tomorrow, God willing! proper working order! BON SCRAPATIT!!! A - B - C - D - E - F - G ... A DIAMOND-STUDDED COPPER ALPHA TO YOU FROM ME!!! Greetings DEAREST ones! I shall be brief as I have ached from head-to-toe ALL day long and I'm already into tomorrow and I'm still tender even after finally breaking down and taking Ibuprofen! No worries. I shall be fine!!! After watching Mystery Diagnosis a few nights ago with Robert, I have dug into Hashimoto's once again. I fit too many of the symptoms, which brings me back to what I discussed with some of you quite some time ago. I believe that I have never TRULY been properly treated for my Hypothyroidism! In other words, even after being on medication for over a decade now, I have always continued to present symptoms which means, the medication is not doing what it is intended to do. Again, I am faced with doctors who go by the numbers and NOT by how I feel. The thyroid is just WAY too important in the proper functioning of our bodies. So, sometime this week, I am off to check out my own link posted close to the bottom of my sidebar (now on the left hand side! ), "Stop The Thyroid Madness" to do some more reading. I have another WONDERFUL resource in a newsletter I get periodically from Mary Shomon who is an expert and a trailblazer in helping men and women to find proper treatement for their thyroid issues. I will rustle up a link for her as well, but if any of you are interested and have never heard of Mary, you can find her at About.com. I wish to thank those of you who have already shared your stories, feelings, memories, etc. of September 11, 2001 with us. WOW! I am VERY deeply touched and hope to see more of you posting throughout the week. Living in a VERY small community and not having had television reception at that time of my life, I was sitting in the waiting room of our local dentist office when I overheard Linda, the receptionist talking about her children being sent home from school. Yo-y0 here thought her children's school experienced a bomb threat or something. When I questioned Linda as to what had happened, the lady sitting across from me said, "You haven't heard? Our country is under attack"! Gosh, she must have thought I'd just crawled out from beneath a rock or something! Well, I guess I sort of had! I was dumbfounded. It was all too surreal for me and especially since I had nothing visual to support the disclosure. After my appointment, I went home and turned on the television even though I knew it would be difficult to see or understand what was being said. After the boys all arrived home from school, we spent most of the evening keeping up with the news as best we could. The MOST difficult part for me in retrospect was listening to the surviving spouses that had cell phone conversations with their husbands/wives aboard the planes and or in the towers. There was A LOT of courage and heroism on display that day for which I am ever thankful. Tonight's FREEBIE is, indeed, an alpha plus a few other goodies. This is NOT the alpha that MOST of you have anticipated I am sure, but not to worry, you will be getting the other one as well. This alpha, in tonight's download, was part of the original *Its's Falling* scrapkit! Have a TERRIFIC Tuesday everyone!!! "LEAVING" Y'ALL WITH SOME MORE GOODIES TO START THE NEW WEEK!!! My thoughts and prayers are with ALL of those who lost loved ones and for ALL of us as we are prompted to remembrance during this next week. I actually had a flight cancelled that was scheduled on the 13th and was only detained a few days. I flew out of San Jose International Airport here in California and was headed to visit family in Minnesota. I remember LONG lines but other than that, it appeared to be business as usual. If any of you have a memory you would like to share of that time of our lives, please post and I shall make sure to read them. I shall see you all tomorrow and hope to be starting myself a MOST productive week! and hope the same for y'all! Hope you like tonight's installment of *It's Falling* and y'all know there is an ALPHA coming up, right??? UH, HUH!!! Stay-tuned! P.S. I shall work on posting a new slideshow for your FALL masterpieces in the next day or two! THANK YOU FOR SHARING!! !